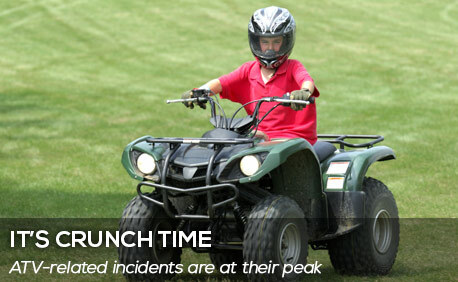 “Crunch time” – that’s what they call the period from May through September, when ATV-related incidents are at their peak. ATVs have become increasingly popular; dealers reported sales of 228,305 new ATVs in 2013. Sadly, each year thousands of riders are injured or killed while out on an ATV adventure. During the first week of June, we read of six-time Olympic gold medalist swimmer Amy Van Dyken being critically injured in an all-terrain vehicle accident in Arizona. Amy hit a curb in a restaurant parking lot and went over a dropoff of 5 to 7 feet. The accident severed her spinal cord at the T11 vertebrae; slivers of bone narrowly missed rupturing her aorta. After being airlifted to a hospital in Scottsdale, Amy underwent surgery to stabilize the spine. She remains paralyzed and has a long road ahead of her in rehabilitation.